Hanami (“flower viewing”) is an auspicious time of year for Japan; it occurs every spring, and centers around the blossoming of the sakura (cherry blossom) trees. There are websites to track the blooms, sakura-themed foods and treats, and lots of picnics where families, groups of coworkers, friends, and others gather under the trees to celebrate the arrival of spring. Okinawa, Japan’s Southernmost prefecture, is the first to enjoy Hanami season. It differs in a couple of ways to the rest of Japan: It starts in February, almost two months before the rest of the country. The variety of tree is another big difference, with Okinawa home mostly to a Taiwanese species that has a darker, more vibrant, hue of pink than its pastel Japanese counterparts. The cherry blossoms spread from North to South, with the last blooms petering out towards the end of March, around the time the rest of Japan starts to see its first blooms. The Northern Hanami festivals are the best for cherry blossom spotting — read on to discover some of my favorite places. Motobu Sakura Festival takes place in a park a short drive up Mount Yaedake. Sakura trees line both sides of the winding mountain road, making for a spectacular drive before you even reach the main event. 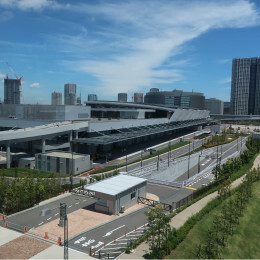 After you park up, make your way to the park area to enjoy food, music, performances, and, of course, the sakura trees. You will find several varieties of tree here, from a species with the bright pink blossoms, to a species with almost white flowers. There is also a kids playground, great for keeping small children entertained. Entrance is free, and you’re welcome to picnic under the trees. Other facilities include vending machines and public restrooms. Nakijin Castle Ruins in Kunigami District also plays host to a Sakura festival annually. There is a charge for this one, but there is plenty of parking, food stands, local craft stalls, and entertainment to make it worth the money. 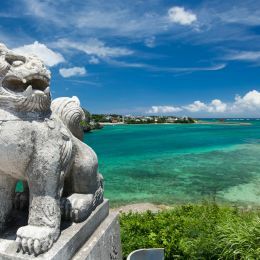 Plus, as well as viewing the beautiful sakura trees that smatter the castle grounds, you can soak up some Ryukyuan history and a great view of the ocean. By far the best part of this particular festival is the steps leading up to the main body of the ruins; it is lined on each side by sakura trees, and it makes a wonderful spot for photos. The view going up is the best, but the view from the top allows you to capture not only the trees, but also the ocean and the castle grounds. Centered around the steep ruins of Okinawa’s main Northern town, the Nago Sakura festival is a lively event with much to see. Food stalls and local vendors trail through the streets of Nago. Music wafts through the air, and parades light up the street. Parking is difficult, but the event itself is free. Nago Castle Ruins sits atop a steep set of steps, lined on both sides by Sakura trees, making for a whimsical climb. The vista from the top is equally impressive, and the grounds, whilst small, are pretty and also have a few well established sakura trees to admire. Sakura trees generally blossom from South to North, so Kyushu also sees hanami season early. Fukuoka, a prefecture as well as a city, is a good place to be for some sakura spotting! One of the best places to take in Hanami in Fukuoka is at Maizuru Park, at the base of Fukuoka Castle. It is home to around 1,000 sakura trees, a breathtaking display of nature’s beauty. 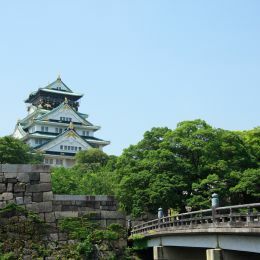 Whilst there, enjoy all the park has to offer, including the Korokan Ruins Museum, Fukuoka Castle, and Heiwadai Baseball Stadium. It’s a fascinating walk through time. At night, come back for the Castle Wall and Sakura Illumination festivities, and see the park in, quite literally, a different light.